One of the birthday traditions in our family is that the birthday person gets to choose the day’s main meal menu, and the birthday person gets to choose the food for his or her party, if there is one. So far, every birthday party for every kid has featured Party Pizza and chips, along with cake and ice cream of course. This year, Joe broke out of the rut and requested crepes for his birthday party meal. My kids love breakfast for lunch or supper. It is probably their all-time favorite. It’s really no surprise that crepes are a favorite. It’s kind of like eating dessert for your main course. And then for a birthday party, you obviously can’t skip the birthday cake. Hmmm…Joe’s a pretty smart kid–dessert for lunch and cake for dessert. He knows how to work the system. Aside from the taste and the novelty of having “breakfast” for dinner, I think my kids love that they get to pick their fillings. I normally set up a crepe bar with all kinds of toppings to choose from, and they build their own. So far, most of our fillings are of the sweet variety–strawberries, bananas, blueberries, whip cream, powdered sugar, peanut butter–but you can definitely put most any savory filling inside too. So far, my savory fillings have only included scrambled eggs and bacon, and a cheesy mushroom. 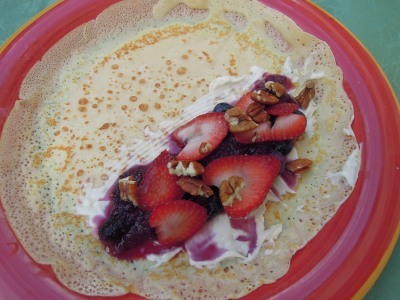 Crepes can be made fancy for a special occasion or simple for an everyday meal. I have done a crepe bar for a couple of different showers I have thrown, and I make them as part of our regular rotation at home. 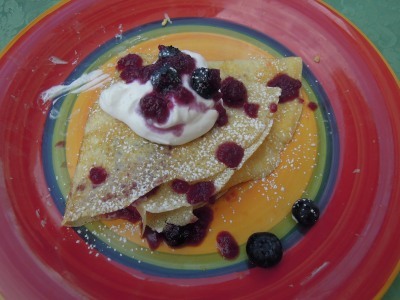 I have also made crepes as a dessert after a meal. With the whip cream and fruit, they make a wonderful light dessert. You could also add ice cream… Yum. If you can make pancakes, you should be able to make crepes. 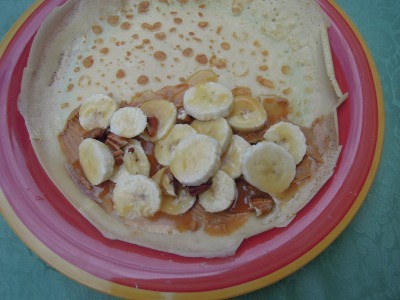 Crepes are just a super thin pancake. All you need is a little wrist action, and you’ll have it down. Just remember they are called crayps, like ‘cape’ with an ‘r,’ not creeps. In the past I occasionally helped out a couple who owned a food truck type business selling crepes, and they said they frequently had people come up to their window to ask what “creeps” were. Well, whatever you want to call them, know that they are a tasty treat for breakfast, brunch, lunch, snack, supper, dessert, and maybe even your birthday. 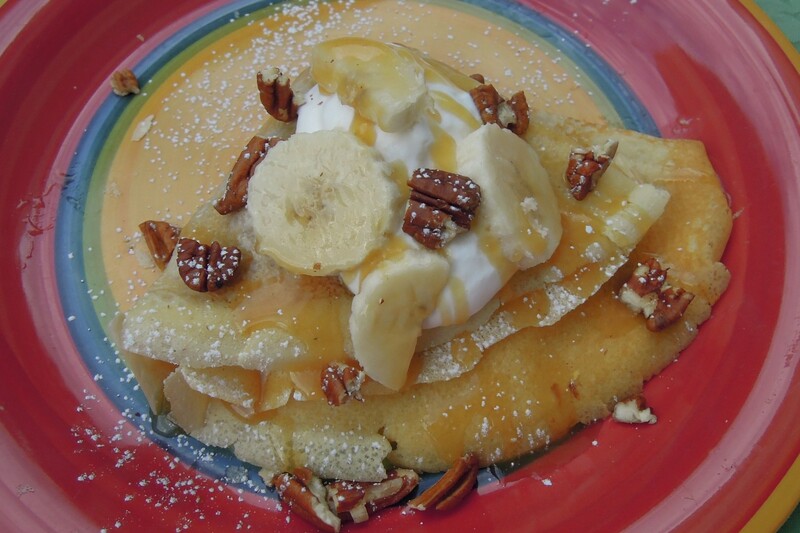 *If you are making savory crepes, you may want to omit the sugar and vanilla in the recipe. 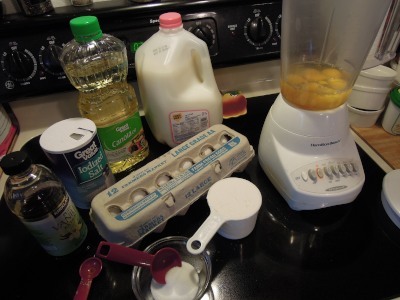 In a blender or in a medium bowl, combine eggs, milk, flour, salt, and oil. Blend until smooth. 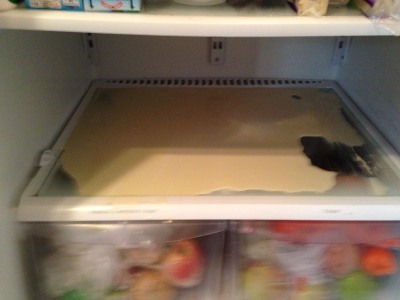 Cover and refrigerate for an hour. (Most crepe recipes include this direction, but I am not entirely sure why. I usually let mine rest, but sometimes I don’t have time. I have not been able to detect a difference in crepes made fresh vs. crepes that have rested first. 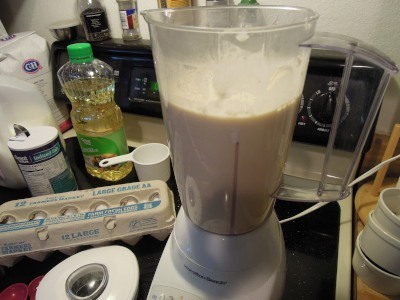 Mix in a blender or bowl. Heat a non-stick frying pan over medium heat. 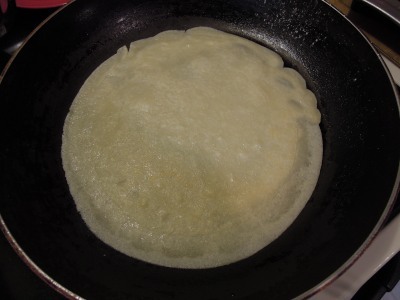 Lightly spray with cooking oil or brush with butter before making the first crepe. 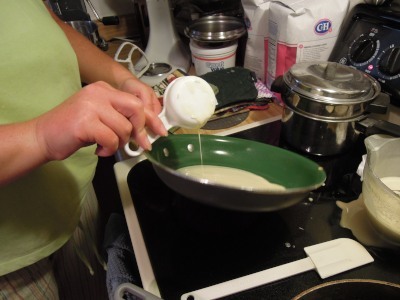 Depending on the size of your pan, fill a measuring cup with batter. One of my pans takes 1/4 cup batter, and my other pan takes 1/3 cup batter. This is one of the secrets to getting consistent crepes. Once you know how much batter it takes to cover the bottom of your pan with a paper thin layer, it will be easier to finish. If you have never made crepes before, just go into it knowing that the first couple may fail. Crepe batter should be very thin. 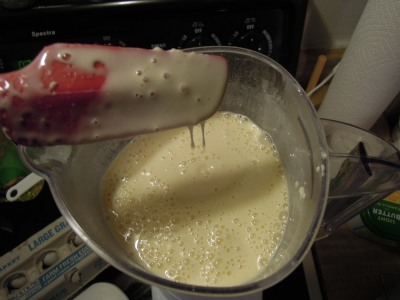 Pick up the hot pan in one hand and the measuring cup of batter in the other. 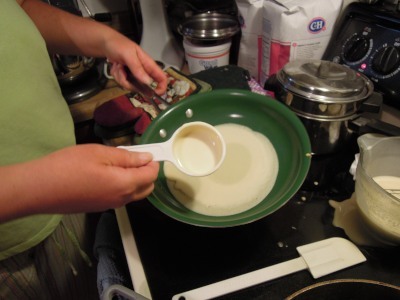 Pour the batter into the middle of the hot pan and then begin slowly tilting the pan in all directions until the bottom of the pan is covered. Return the pan to the burner and let it cook for 2-3 minutes until the edges look set (a little dry) and the crepe is a light golden brown. Flip the crepe and cook the other side for another 1-2 minutes. If your crepe is taking much longer to cook, you may want to turn your heat up a tad, or if it is cooking super fast, you want to turn your heat down a tad. My favorite tool for crepe making is a large heat-resistant rubber spatula. It easily slides under the crepe because it is thin and flexible. 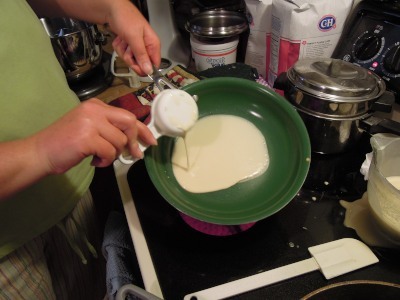 Pour all of batter in center of pan. Begin tilting the pan in all directions. Tilt until the bottom of the pan has a paper thin layer of batter. 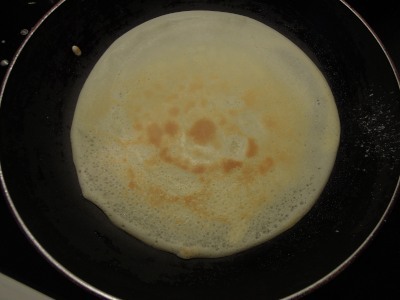 The crepe will set and begin to dry on the edges. Now flip it over. 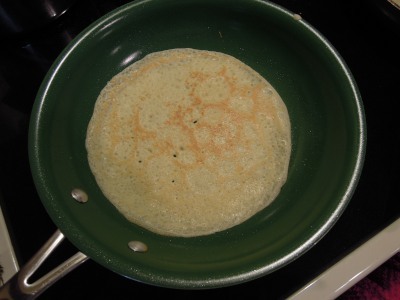 The crepe should be thin and lightly browned. Crepes should be a little lacy looking and almost see-through. 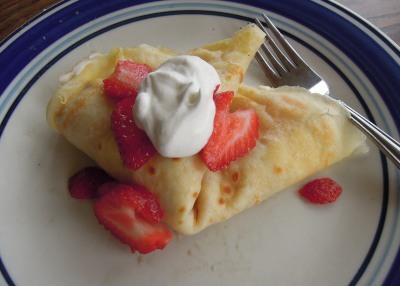 Leftover crepes can be stored in the refrigerator in an airtight container or bag and reheated in the microwave, a warm oven, or even a warm frying pan. They can also be frozen. If your crepes seem a little sticky, you can put parchment paper between layers. 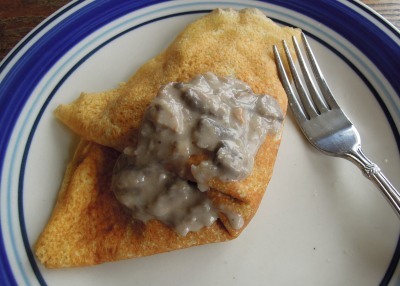 *If I am making crepes for a large group, I have found that it is best to either get a good head start on making them or make them all ahead of time and keep them in a warm oven. The people will eat them so fast that they will be waiting for you for each crepe. Strawberry with a cream cheese filling. Kids also love Nutella and strawberries, but we had no Nutella this time. Whipped cream and more strawberries on top. Nina requested blueberry, banana, pecan this time. Whipped cream, blueberries, and blueberry sauce on top. 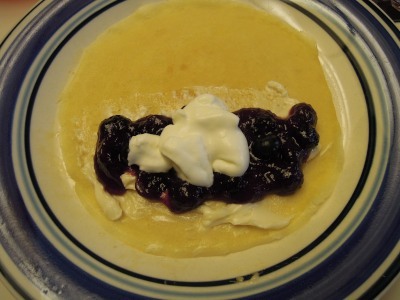 Just blueberry sauce and cream another time. Pictures don’t always show it, but this is a cheesy mushroom filling that is fantastic. Creamy peanut butter, banana slices, caramelized pecans, and maple syrup. Whip cream, bananas, syrup, and pecans on top. Blueberry sauce: I followed these instructions from Allrecipes.com. Mushroom filling: I followed the directions for just the filling of this crepe cake at Smitten Kitchen. Caramelized pecans: The directions are in my post for strawberry spinach salad. Sweetened whip cream: Chill bowl and beaters and then beat 1 cup of heavy whipping cream with 1/3 cup powdered sugar and a teaspoon of vanilla to desired thickness. 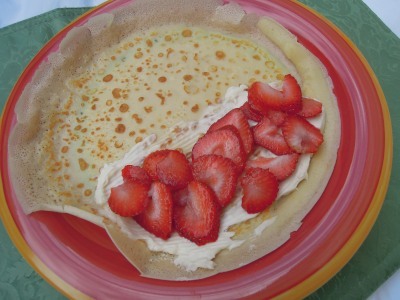 Crepes can be successfully made gluten free using Glutino all purpose gluten free flour blend. Thanks for the input, Jan.